We wish to be your partner in production. Our company objective is to provide the best production quality to the market, to produce both simple and complicated parts with the technology of good quality and reliability. Hanval Metall stands ready to solve your subcontracting demands for short and long-term production needs. Our company was founded in 1992 during the economical correction and privatization process, which dominated in Estonia these days. We had to find the advantages from the environment we were doing business in. The management, based on their graduated production skills and experience, decided to start subcontracting business as the most suitable for the resources Hanval had. During the privatization process the metal works, production of agricultural machinery and hydraulics seemed to have the best competitive advantage in Estonian machining industry. CNC machining was selected as Hanval’s way. The economical activity in Hanval Metall increased significantly in 1994, when the long-term contract with subsidiary of the Parker Group was signed. The growth in first years was so rapid that the company was forced to extend their production space twice during the 1995. The production activity normalized in 1996. From these days Hanval Metall has a production space for 1100 m2 altogether in Karksi-Nuia and in Viljandi. People in the company have highly qualified skills for both conventional and CNC machinery. The majority of Hanval Metall’s production has been related with details for filtration and hydraulic machinery. We have experience in working as well stainless steel and as well aluminium and other soft metals. 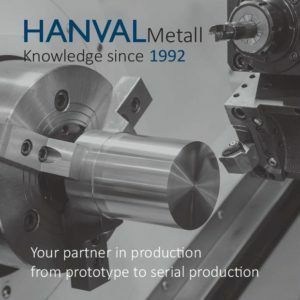 In addition to the Hanval Metall’s production plants in Karksi-Nuia and in Viljandi, there are partners around us who are able to add the production volume to our capabilities if needed. We aim to offer our customers delivery times which are as flexible as possible. Hanval Metall runs lean manufacturing principles that allow focus on customer needs, cost cutting and lead time reduction. Anyway, depending on the nature of business the actual delivery time has been between 1 week up to 2 months. On average, 60 % of annual turnover goes to export. TAKE A CLOSER LOOK AT OUR BROCHURE HERE.